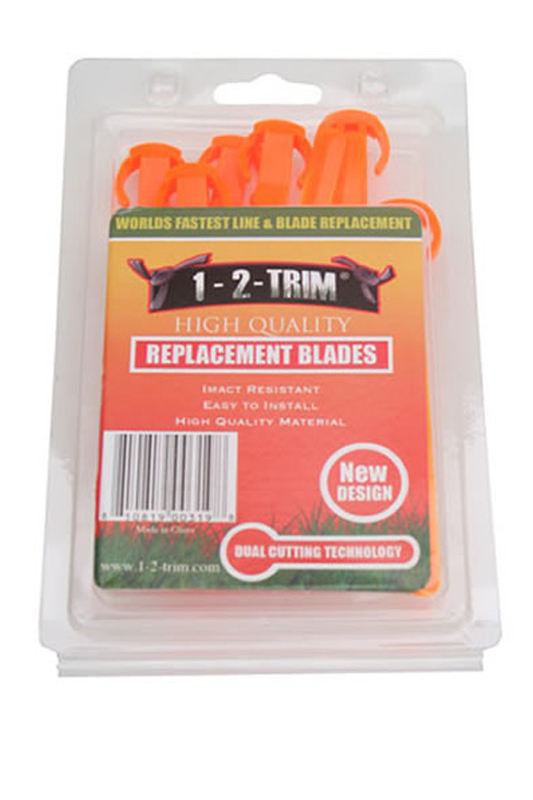 Replace broken or worn brush cutter blades with this handy 9-pack of replacements. They're the exact same part that comes with 1-2-Trim replacement heads when new, so they'll fit perfectly, and work just as well. With repeated use, this part is meant to wear out, so replacement is inevitable. When you get parts from us, you can ensure original quality at the lowest possible price, so get this pack to restore power and make your trimmer work like new again. Thanks to the unique design and fast loading action, anyone can slide an old set out and install a new one in a matter of seconds. Once in place, the blade will be totally secure, and unable to fly loose. Use normal line for trimming grass and weeds, but switch to these powerful cutting blades for thick brush or large patches of unwanted growth. Impact Resistant. The durable plastic will handle plenty of abuse. They wear slowly when compared to other options, so easily power through large jobs with no replacement necessary. Easy To Install. Thanks to the advanced design, you can easily swap line for blades, and installing them requires no tools and very little time. Simply slide out whats currently installed, then slip a blade into each pivoting holder. High Quality Materials. Superior materials result in a longer lasting blade, and more destruction with less effort. Genuine Part For An Exact Fit. Don't worry about whether or not they will fit, and don't waste money on inferior knock off versions. Buy replacement parts from us to ensure quality and compatibility at the lowest cost. Hard work results in worn parts. Rejuvenate your trimmer head to make it work like new again by replacing the blades. Order Yours Today! An Easy-To-Use, Manual Pump and Siphoning Tool. Replacement Rotating Eyelet String Holders For Your PivoTrim Pro. A Brush Cutter And String Trimmer In One! Universal Replacement For Gas Powered Trimmers.